Star Wars Battlefront II‘s ongoing closed alpha has already brought word of the sequel’s sizeable character roster – General Grievous, Iden Verso, Darth Maul, and Captain Phasma were all name-dropped in a recent Reddit leak – but we now have a little more information regarding one hero in particular: Rey. Daisey Ridley’s Jedi-in-training has become a huge fan-favorite ever since her debut in Star Wars: The Force Awakens two years ago, and considering that Battlefront II is set to launch four weeks before the arrival of Rian Johnson’s sci-fi sequel, The Last Jedi, we imagine Rey will be one of the more popular characters among Battlefront II users at launch. But what can we expect from the relative newcomer? A new Lightsaber, for one, along with a pre-order incentive that opens up a unique in-game costume inspired by Rey’s appearance in The Last Jedi. Gameplay-wise, it appears Battlefront II users can expect to call upon a handful of special abilities while controlling Rey, including some good old-fashioned Jedi mind tricks. Those details were unearthed alongside a new action shot of Daisy Ridley’s in-game character wielding a ‘saber, which you can find below. 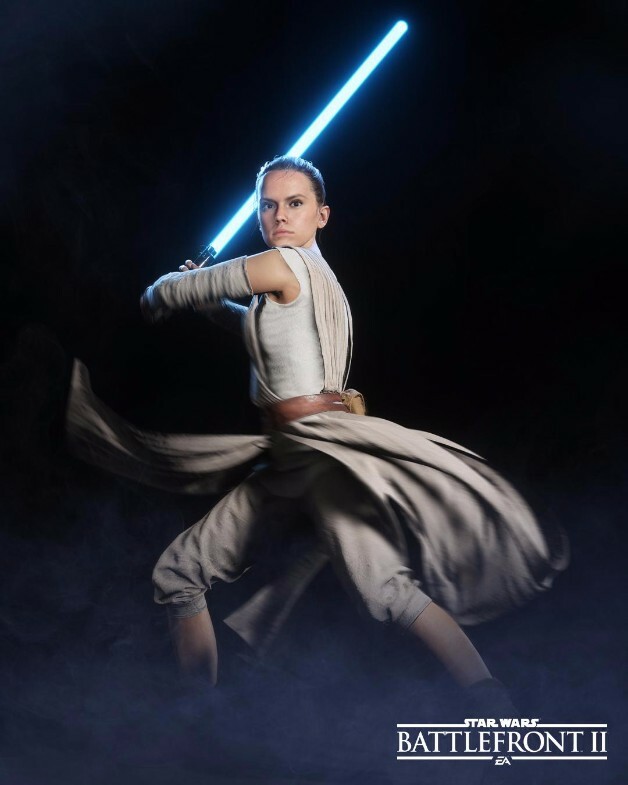 Indeed the Jedi Mind Trick is one of three primary abilities lining Rey’s arsenal, with the other two being Dash Strike, a move that will evoke memories of Daisy Ridley’s heroine charging along a beach in The Last Jedi‘s inaugural teaser, and Insight, a skill that riffs on the Detective Mode mechanic popularized by Rocksteady’s Arkham series. Star Wars Battlefront II is one of three high-profile Star Wars titles in development, given Respawn and Visceral Games are toiling away on their own licensed products. The latter studio is purportedly working on a third-person action game codenamed “Project Ragtag,” and it may even include a gunslinger companion.